Back in the days, the town crier was a person employed by a town council to make public announcements in the streets. 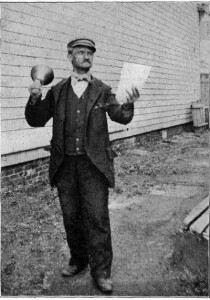 The crier was also used for court or official announcements. Criers often dressed elaborately, by a tradition dating to the 18th century, in a red and gold robe, white breeches, black boots, and a three-cornered hat, the quaint tricorne. In Medieval England, town criers were the chief means of communicating news to the townspeople, many of whom could neither read nor write. Royal proclamations, local bylaws, market days, advertisements were all proclaimed by the town crier throughout the centuries. Sadly, but inevitably, town criers disappeared. They were replaced by a more modern form of communication – the newspaper. By now you should get the drift. The powerful and influential Tribune Co., owner of the Los Angeles Times and the Chicago Tribune, has filed for Chapter 11 bankruptcy protection. With advertising revenue down 16% from a year ago, even the mighty New York Times is struggling to survive. The company is trying to raise some US$225 million by mortgaging its newly minted Renzo Piano-designed skyscraper headquarters in Manhattan – and we all know what can happen to a mortgage. Like the town criers of old, the newspapers of today are facing the threat of a new technology – the Internet. The newspaper delivery boy and the sidewalk kiosk cannot compete with the distribution provided by the Internet. The news portals, like Drudge, the lowly blogs and text alerts are sending passé newspaper technology the way of the old town crier. Yes, newspapers could publish themselves on the Internet – but how could they monetize their sites sufficiently to meet expenses, when the Internet is awash with free news? Monetize is the current great Internet word. It’s all about how to make your website or blog pull in some cash. The answer is simple – the newspapers can’t monetize worth a dime. The conclusion is inevitable – newspapers will be joining the town crier, as another quaint historical footnote in the Wikipedia. Senior figures at the UK’s venerable (now vulnerable) Guardian News & Media (GNM) are being forced to consider a move to an entirely online operation. Oldy moldy Alan Rusbridger, the Guardian chief who lives in the past wants to develop the Guardian’s digital-only US operation before closing the print edition. The Guardian has been suffering losses of £44 million a year and preparing for a paperless future by expanding its U.S. and online operations. This foray into online operations as resulted in a 16% increase in digital revenues to £45.7 million last year, however, not enough to cover the publisher’s operating losses. It seems as though the ubiquitous AutoTrader, which is owned by Guardian Media Group, GNM’s parent company is also in danger. Guardian Media Group also has investments in AutoTrader’s publisher, Trader Media Group which has suffered big losses. It now seems likely that the Guardian will stop running the presses altogether. Now the print media guys are dropping like flies. Newsweek bites the dust and will transition to an all-digital format in early 2013. As part of this transition, the last print edition in the United States will be the Dec. 31 issue. The new Newsweek will be named “Newsweek Global,” and will be a single, worldwide edition targeted for a highly mobile audience. Here is the kicker that may just kick Newsweek Global out of business for good. It hopes to be supported by paid subscription and will be available through e-readers for both tablet and the Web. How does Newsweek Global expect to compete with those who publish the news in the Internet FOR FREE?